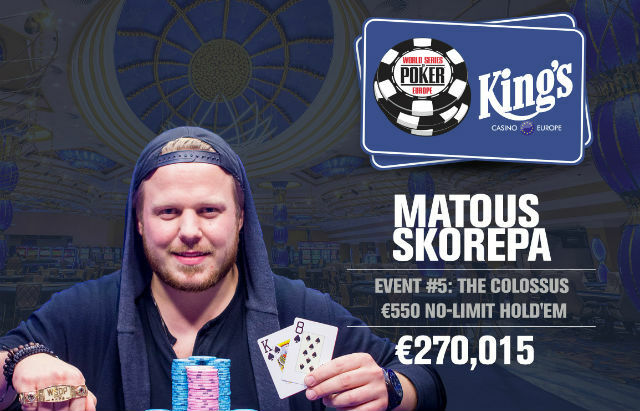 Local Czech grinder, Matous Skorepa found the finish line in the World Series of Poker Europe Event #5 (The Colossus, €550 No-Limit Hold’em) besting 4,115 runners on his way to first WSOP bracelet and the first place prize of €270,015 ($317,269). The final table got underway with the majority of the table feeling the pressure to make moves as six of the nine seated had under 20 big blinds with only chip leader Jonathan Khalifa, and the eventual head-up finalists Florian Fuchs and Skorepa, sitting with any room to breathe. It didn’t take long before the bustouts began. France’s Gaetan Cauchy picked his spot and three-bet squeeze shoved his roughly ten big blinds over Pascal Pflock’s early position raise as well as a button call from Skorepa. Pflock ended up laying down his but Skorepa wasn’t going anywhere with his and made the call. Cauchy tabled the for a single overcard. Looking for one of the final two aces in the deck the run out of provided no help as Skorepa’s full house scored the first knockout. A full orbit later two more players would hit the rail. Pflock shoved his final six bigs under the gun holding the . Nebojsa Ankucic, who entered the day with a scant four big blinds, re-shoved for less with his suited . Right behind both of them, Khalifa woke up with a suited king of his own and, covering both, made the call. Khalifa’s had Ankucic dominated but the flop of turned the table for the moment. As Pflock was looking for a miracle three to get back in the hand, the gin card would come for Khalifa as the turned, giving him Broadway. Looking for a spade or a queen to save his tournament, Ankucic watched his WSOPE bracelet dream end with the meaningless river card. Covering both players, Khalifa scored the double KO as Ankucic bowed in eighth and Pflock in seventh respectively. Local player Roman Motovsky found a decent spot after he three-bet shoved his final seven blinds from the big blind. Skorepa had raised the action with the and was flatted on the button by Khalifa who shared an out, with his suited . After Motovsky shoved, Skorepa called, Khalifa folded and the flop, favorable to the player at risk, ran out . Both players spiked a pair and Motovsky was in great shape to double. One of the final two aces, the , peeled off on the turn, putting Motovsky behind. It was handshakes for Motovsky as the completed the board and his run at the bracelet. The next elimination came roughly 40 minutes later as Khalifa was set up to score his third knockout of the final table. After opening the action, Greece’s Makarios Avramidis stuck his final 10 bigs in the middle holding an unconnected ace, . Folded back to Khalifa, he had snapped revealing the best hand in poker, the old . The board ran out clean for Khalifa’s aces as Avramidis, a World Series of Poker bracelet winner in 2015, was sent off in fifth place to enjoy the second best cash of his career. With only a handful of recorded career cashed, Bulgaria’s Ivaylo Sivinov was far and away in the biggest spot of his poker life. In blind-on-blind action, the Skorepa open shipped his stack on Sivinov’s big blind. Sivinov peered down at and made the call. Skprepa had the goods this time, revealing . The run out of didn’t give Sivinov a lot to work with. The paired him up but two red tens would hold as the landed like a brick and meant that Sivinov would finish in fourth. Three-handed play would last for roughly an hour with the blind levels rising and the chip stacks flattening out keeping Khalifa, Fuchs and Skorepa all within striking distance of each other. Finally, when the next bustout arrived it was again Khalifa who was involved, only this time the bustout was his own. Skorepa opened for roughly 2.5x and Khalifa shipped his 20 big blind stack over the top with . Skorepa, covering Khalifa, tank-called and showed down up the for a coin-flip to determine control of the tournament. The flop was good for nines, . The turn was the . Feeling good, embraced by his rail with only 8 outs to fade, the chipleader at the start of the final table couldn’t hold as the spiked on the river. Skorepa took a 2:1 chip lead into heads-up battle against Florian Fuchs and from there Skorepa went on a roll. Dominating heads-up play, it only took 11 hands for Skorepa to felt the Austrian. In the end, Fuchs, at a massive chip disadvantage made his final stand by calling Skorepa’s shove holding the . Hoping to have two live cards, Fuchs was crushed as Skorepa had him dominated showing down the suited . The championship hand ran out , pairing both. But as the hit the turn, it meant kickers were in play and Fuchs was looking for a miracle three-outer to begin a comeback. It was not in the cards as the dropped, Fuchs was eliminated and Matous Skorepa from the Czech Republic was crowned the champion of the Colossus.